So I use social media a LOT. I'm not an expert on engagement or figures but I'm pretty happy with the engagement and followers on my own accounts. I've built them up slowly, trusting in my own instincts and they are where I want them to be. 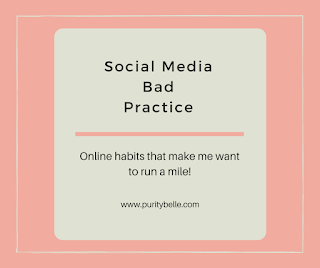 I have read a lot of articles lately about social media practices like buying followers etc. and I'm kind of glad this is being highlighted because I've found in the last while that so many people are using social media in a spammy, intrusive way. I'm not sure if this is because they have been advised to do this or if they are just employing an aggressive sales technique type of approach, but either way, it's extremely annoying. The following are some of the things that are likely to leave me with a very bad impression of a business or individual. Firstly, the whole follow/unfollow technique - this is obviously used to boost your numbers and make it look as if you are very popular. So if you follow hundreds of people, chances are that many will follow back. You then unfollow them all, making it look as if you have far more followers than are following. This is a common tool used by people on Twitter and Instagram. With the advent of apps, however, it is now easy enough to see the people doing this and I just promptly unfollow them. Auto direct messages - they drive me mad and I just can't understand why people still use them. I'm seeing them more and more on Instagram, unfortunately, although it used to be mainly a Twitter thing. They go straight into trash and I would never bother clicking into any links sent with them. This one is Facebook - I've gotten a lot of friend requests lately from people who are members of groups I'm in. This is totally fine if the person feels they relate to me - we might have commented on each other's posts or have something in common or some reason to suggest that adding me as a friend might be appropriate. What I really have a problem with, though, is someone adding me as a friend with the sole intention of promoting their business to me. This is cynical and completely inappropriate and I've recently done a cull of people who added me just to send me a page 'like' invite and then never interacted with me again. Also cropping up lately has been an invite to 'like' a page if I have commented or liked something they have shared. Maybe other people find this ok but it irritates me no end. It's far too 'hard sell' for me. If I've been on your page and wanted to follow it I would have done it already. Another FB problem is people who gather names from groups and send private messages about their business directly to the individuals. This is total spam and incredibly intrusive. Next up, spamming groups directly with your business advertisement without ever interacting with other people. This is frankly just RUDE. It's a particular technique of those involved in Multi Level Marketing companies, although not exclusive to them. And in relation to MLM companies, the lack of transparency in posting is absolutely wrong. The entire system of how this marketing works should be made clear from the outset, so that people can make an informed choice about becoming part of the business. This lack of transparency has most certainly been part of the training given with these organisations and it's frankly duplicitous and immoral. Interact with people - if someone has gone to the trouble of liking your posts or commenting, maybe give them a like in return next time they post something. It can help boost their views and it's just a nice thing to do. If you've bought a product you loved or have stayed in or eaten somewhere good, maybe consider tagging the page and giving them a shout out. They will definitely appreciate it! My technique for Instagram (which is probably my favourite social media tool at the moment) is to go on several times a day and like people's posts. This is a deliberate effort to be supportive of what other people are sharing. Similarly with Facebook, although it's perhaps not as easy to see all the pages you like, I always try to make an effort to like or comment on other small business pages that I have followed. This means two things, first of all, I will continue to see their posts and secondly, it might give them a boost and allow them to reach more customers. I know myself the other people who are likely to support my page and it's important to me to return the favour and try and help them out too which has created a kind of organic little support network. It's nice because everyone benefits. 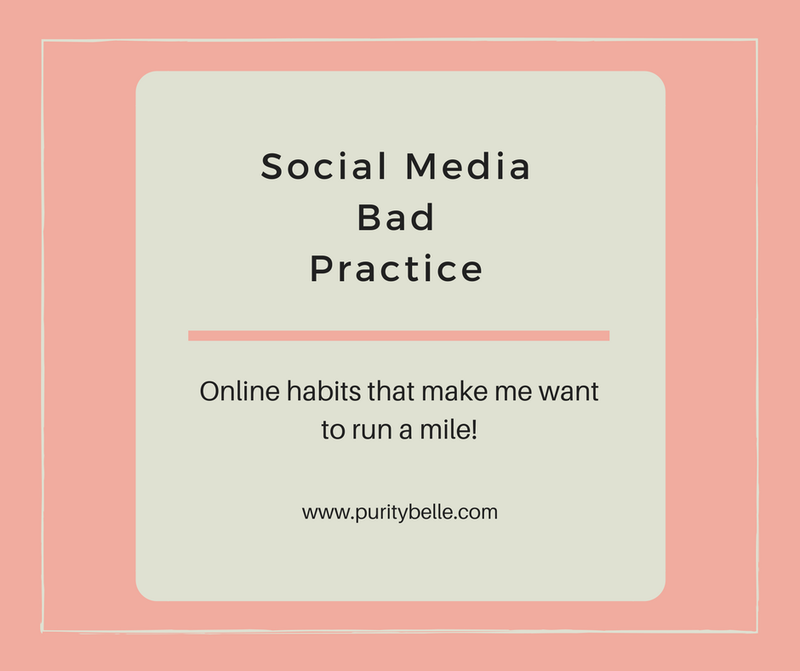 Do you have any practices you hate in relation to social media and how do you deal with them? You might also like my Facebook Groups post and my 5 Reasons to Cut Down on Social Media post. I don't always get time to comment, or my phone plays up. It only takes a second to click the sharing button. So Ifar it's a post I liked I will tweet it or share on my Facebook. I always appreciate any support and tweeting or sharing is great because it just gets it out there to more people. Those things all annoy me too, especially the auto-response things on Twitter. I recently went through my Instagram deleting those follow/unfollow accounts that you mentioned. A lot of it comes down to good old fashioned manners which are sadly lacking in many people these days. I so agree, it is about manners and so many people don't seem to value them at all! I am bad with auto messages. But I know what u mean about random facebook request. Treat with caution my facebook cos i got many family and friends on it. So just now created fan page. I hear you! Many of these things annoy me a lot too and I refuse to do any of them! I love this and agree with you 99.9%. The only place I slightly disagree is asking people for a like on their FB page - I do it (probably asked you to like my page) as I really don't feel it is that invasive, certainly less than a pop up on your blog, for example! Totally drives me mad when people follow and then unfollow - WHY??? Well, I know why, but it doesn't work! The only way to get increased numbers of followers and views is to do as you say - engage and work bloody hard at it! That's kind of how I feel about being invited to like, if I've been on the page I would have liked if I had been interested.Sometimes I just like a particular post but the general content might not suit me! Oh goodness, yes, so many of these! I hate the Twitter auto-DMs in particular. Makes me unfollow a lot of them! I too recently fuond out about, this buying thing! A lot og BIG bloggers do this and I think it is a real shame, you should rewarded by hard work, bot paid work! I totally agree with you on the page liking thing. It is so annoying when people add you as friend just in an attempt to promote their business or increase their page likes. It really gets me nuts. Yes, I just find it so pushy and rude!